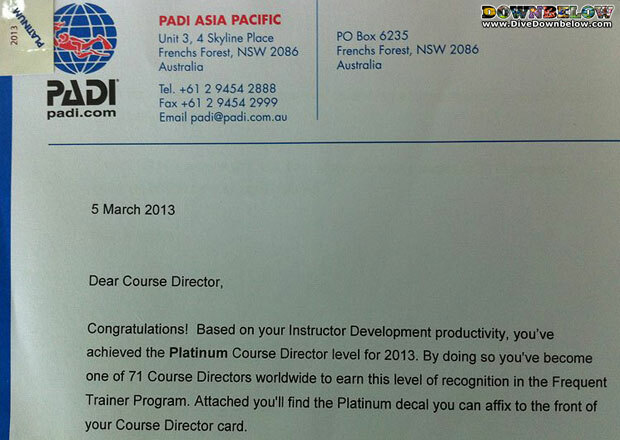 A big congratulations to Downbelow Managing Director and resident PADI Course Director Richard Swann for being awarded the Platinum Award for Instructor Development. Richard is now one of only 71 Course Directors worldwide who were given this prestigious award. This is an acknowledgement to our commitment and dedication in providing quality education and professional diver training through our PADI 5 Star IDC Dive Centre in Borneo. Thanks to Downbelow’s Go Pro team for playing their part in getting this awesome achievement and also to all of our current and past candidates for choosing Downbelow as their PADI IDC centre. Do you want to see what makes us tick? Check out our wide range of dive courses, from the recreational divers to those seeking a career in the diving industry. We have courses that cater to any level of experience. Contact us if you have any enquiries on any of our courses.